An ecosystem includes all the organisms and the nonliving environment found in a particular place. The scale of ecosystems can change based on your perspective. For example you may choose to study your back yard, Chattahoochee National Forest, Lake Lanier or a wild life refuge and each is considered an ecosystem. Ecosystems are very complex. They can contain hundreds or even thousands of interacting species. Watch the following clip from NOVA titled, “Energy Flow in the Coral Reef” to get a feel for the complexity of interactions in a Coral Reef Ecosystem. Use the questions below as a guide during the video. What was the source of energy in this ecosystem? Can you create a food chain from watching this movie? One of the ways that ecosystems are organized is based on the flow of energy from the abiotic to biotic parts of the ecosystem. 1. Autotrophs, or producers – convert energy into food that can be consumed. a. Herbivores feed directly on producers. Examples include cows, deer, rabbits, grasshoppers, and giraffes. b. Carnivores feed on herbivores or other carnivores. Examples include lions, sharks, eagles, and owls. c. Omnivores eat both plants and animals. Examples include humans, bears, raccoons, and robins. d. Decomposers get energy by breaking down dead organisms’ structures. Examples include bacteria, protists and fungi. Note that some organisms may occupy one or more trophic levels in their complex relationship with their ecosystem. Producers store energy in the chemical bonds of the food they make. Stored energy is passed to consumers when they eat producers or other consumers. Look at the example food chains below. Take note that the arrows in a food chain point in the direction of energy/matter flow and not from highest trophic level down to the lowest level. A portion of energy is lost at each link of the chain. You will read about this in the 10% Rule section below. A food web is a model that displays all possible feeding relationships at each trophic level in an ecosystem. Examine the terrestrial and aquatic food webs shown below. Note that food webs are made up of several food chains and always begin with producers that rely on sunlight (and rarely, inorganic chemicals). Ecological Pyramids illustrate relationships between organisms in food chains. 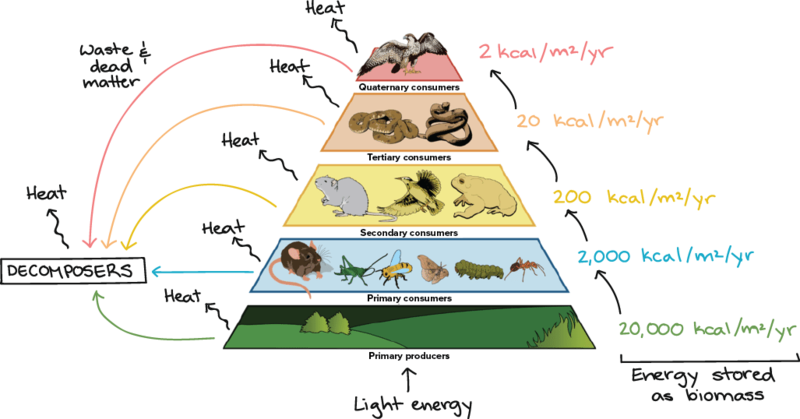 There are 3 types of pyramids: energy, numbers, biomass. Did you notice that each pyramid typically decreases in size moving from bottom to top (it’s a pyramid, after all)? Recall that fewer and fewer organisms can be supported at higher levels of the food chain because less energy is available to them (10% rule). A keystone species is an organism in a food web that has relatively low numbers in relation to its impact on others in the ecosystem. It is so named after the central stone, or keystone, in an architectural arch – holding the rest of the stones in place, which would collapse without it. Keystone species control the types and numbers of other species and help to maintain the structure of the ecosystem.They are usually a predator that prevents the overpopulation of trophic levels below them. Keystone removal – by extinction or otherwise – can have drastic effects on ecosystems. For example the sea star shown in this picture preys on mussels, shellfish and sea urchins that have no natural predators. Removing the sea star causes the mussels to overpopulate and crowd out other species, and the urchins destroy the coral reefs with overfeeding. Some years ago, wolves were absent from Yellowstone Park. Watch this video titled “Wolves of Yellowstone” from Earth/A New Wild to study the effects of removing this top predator from the ecosystem. What impacts did the wolf removal have on the ecosystem? Would you consider the wolf a keystone species?